A cool thing happened to us last month. We were asked to mentor for the Google Launchpad Startup School. This was a huge privilege for us. Being chosen by a company that has conquered the world like Google has, to give advice and mentorship to the next generation of entrepreneurs, doesn’t happen every day. It’s a massive endorsement of the methods we’re using to help health tech startups every day. 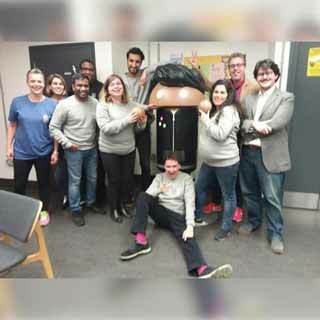 We joined the mentor team at Google Campus in London for 5 days of startup school and worked with ten hand-picked startups awarded a place on the programme. Each day covered a different topic; product, design, marketing (that was us), business and growth. However, we didn’t just mentor for the marketing day. We stayed around to listen to words of wisdom from the best in the business. Here are 10 of the most important tips we picked up, that you can apply to your startup today. We were a bit taken aback when the Google Launchpad programme lead said this. How can it be good to find out your business has no chance of success? But put it this way, it’s better to find out early on that your business idea will not fly, then spend time and money finding this out further down the line. The objective of this part of the programme was to find out if your business is viable and move on from there, not to force viability on an existing business. There are lessons to be learned at all levels of industry. For example, being an employee can give you insight into how business works. It doesn’t matter what industry you’re in, or what level you’re at, you’ll pick up ideas that you can implement yourself later on. Before you embark on your first startup, get some experience under your belt. It’s important to be obsessed with your startup, you aren’t likely to succeed with anything less. However, you still need to listen to advice from investors, mentors, team members and customers, as well as family and friends. It is not a positive trait to dig yourself deeper into a hole when others are trying to help you out. Don’t take their advice blindly, do your own research on what they suggest, but please don’t ignore it. Following on from Tip #3, pivoting your business is not a bad thing if it comes from diligent decision-making and informed analysis. Some of the biggest companies in the world have pivoted. Twitter started life as a feature in a podcast directory. It doesn’t mean you were wrong with your first idea. It doesn’t mean you’re weak. It means you’re flexible, dexterous, and capable of considered thought. These are good traits to possess, and they’re possessed by the best in the business. Why are you travelling down the startup route? Do you want to make a ton of money? Or are you looking to change the world for the better? Are you passionate about your business idea, or the idea of being in business? Do you see yourself as the founder, steering the ship? Or would you rather be the CTO, leading the tech side of the business while someone else plots the course? Do you plan to exit, or expand? Figure out why you’re starting a business, and make sure every decision you make goes through this filter. This sounds obvious, but so many would-be entrepreneurs don’t do this. Before you start your business, you need to have the knowledge to take a business forward long term. Just having a great product or service idea isn’t enough. Knowing the right thing to do at the time isn’t enough either, that just gets you over the current obstacle. Make sure you learn the frameworks to make a plan for your business. Then make that plan, and get on with it. You can do this yourself, or bring in the skills that you need to do it. You may be early on your startup road, pre-revenue, but that doesn’t mean you shouldn’t have the legalities in place already. Who is full time? Part time? What does that look like in terms of hours, and the all important shares and equity? It’s key that everyone in the startup knows their role and benefits so they are motivated, all pulling in the same direction. It will avoid stressful, and possibly costly, situations further down the road. Being a founder does not automatically mean you’re an expert in everything. Nor does it mean you need to become an expert in everything. There is a cost to learning the art of branding if you’re a techie. That cost is the time you’re spending away from the technical side of your startup, you’re time isn’t free and the business will suffer. Let’s face it, you won’t do the best job of branding either. The best thing is to get a good team around you, so you can focus on what you are good at. There are great agencies out there (hint hint) and great people that can do every other task too. Plus, you won’t burn yourself out working an 80 hour week trying to do everything yourself. Remember, for your own sanity, when you’re putting your team together, look for people who have an understanding of what it means to work for a startup. If you don’t, you’ll find yourself saying ‘but we need to do it leaner’ like a broken record. The Google Launchpad mentors had strong words to say about the buzz phrase ‘growth hacking’. ‘Growth hacking is high gains, but high risk and short term. Growth marketing is high gains, but medium risk and long term!’ Google went from a startup in a garage to one of the biggest companies in the entire world, so who are we to argue with that? Those were the 10 most useful lessons we learned from Google Launchpad Startup School. At eye catcher, we’ve compiled a programme of lessons on how to get your health tech startup growing. The lessons in the programme are exclusively for the startups selected to attend the Google Launchpad Startup School, but we want to share them with you. The lessons cover product development, design, marketing, business and growth. We’d like you to have this series for FREE Sign up here and we’ll get you started..